How happy would you be if you knew you could dig into a pancake with berries and whipped cream and feel no guilt whatsoever? Probably pretty happy. How happy would you be if I told you this is a grain free dutch baby with blueberries is super brain food and keto friendly? Probably pretty happy. 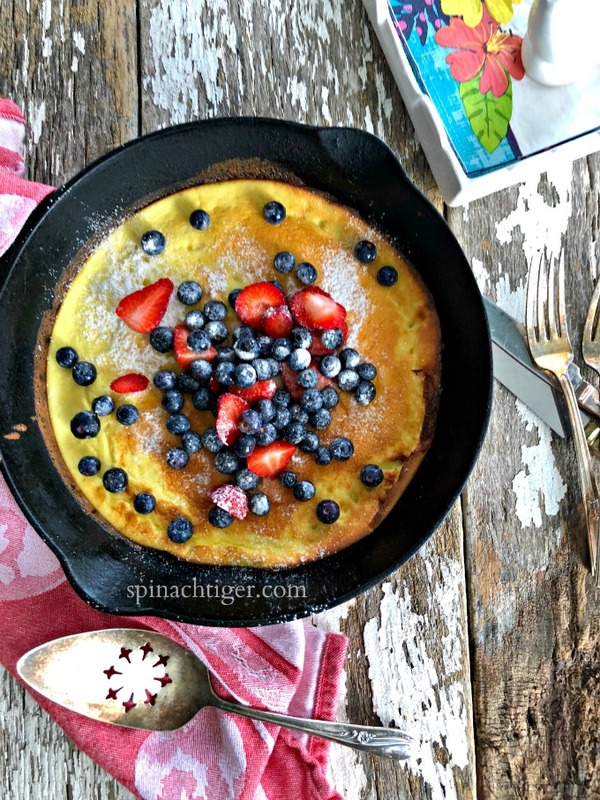 How happy would you be if I told you the grain free dutch baby was super easy because it’s baked in the oven? Probably pretty happy. A dutch baby is a German pancake that is baked in a skillet. As it bakes, it puffs up and is ready for fruit. I’ve made an apple dutch baby here and a sausage dutch baby here with all purpose flour, but they could easily be adapted with grain free flours. I’ll come back and do that in another post. 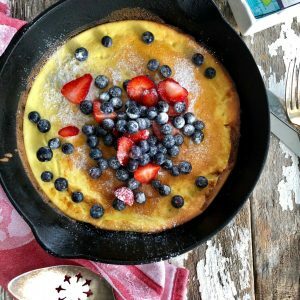 I used two grain-free flours in this grain-free dutch baby recipe, almond flour and coconut flour to get the taste I was looking for. If you follow me on instagram I told you that I was going to test and retest this recipe until I got a recipe worthy of sharing. I kept my word. In total, I made four versions of my grain free dutch baby, until it tasted remarkable and had a puffy texture that wasn’t eggy. This is how Spinach Tiger works when it comes to foundational recipes. I knew if I could get a good basic recipe, I would be able to go many ways with this, including some savory options that I will show you in the future. I made four different variations of almond flour, coconut flour, baking soda vs. baking powder, sour cream vs. plant based milk and on the 5th version, I got exactly what I was looking for. In some versions, the almond flour dominated too much and in some cases, it was too eggy. I think my version is just right. The 5th recipe: 1/3 cup almond flour, 1 tablespoon coconut flour, 3 extra large eggs, 1 teaspoon baking powder, 1/2 cup sour cream and we loved it. To this I added both orange and vanilla extract which didn’t overpower but balanced out the almond flour. As far as a sweetener and confectioner’s sugar, I used powdered erythritol (Swerve). You can use stevia, or skip this and just top with fresh berries. As far as a dairy free version, you can substitute sour cream with a nut milk and use coconut oil instead of butter. 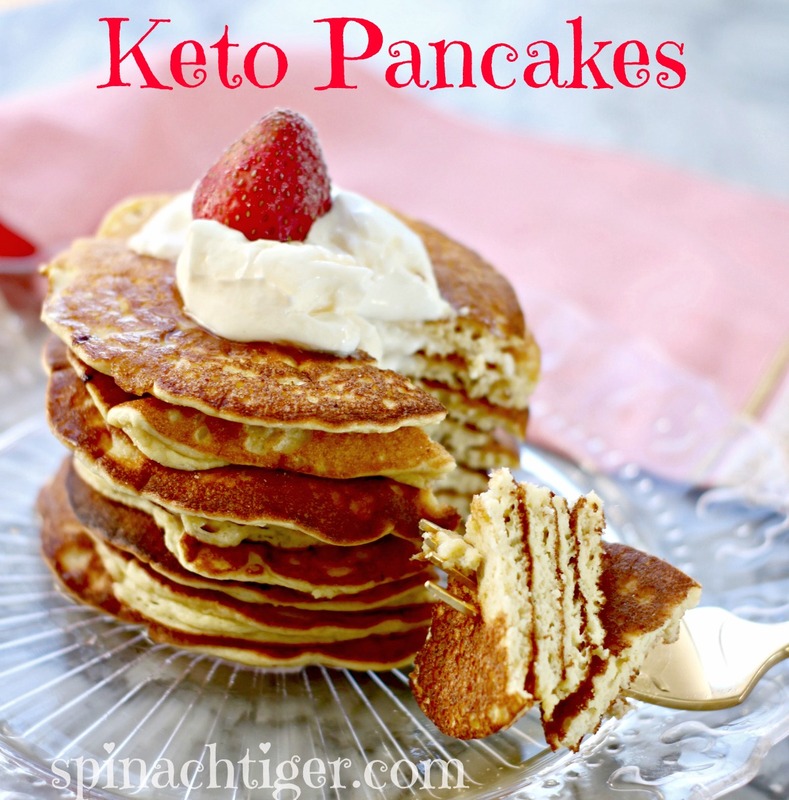 You will probably also love my keto pancakes. Just so you know, these can also be baked in the oven and everyone who has tried them has been very happy. Disclosure: This site contains Amazon affiliate links, which earns Spinach Tiger a small commission to aid in operating costs, but does not increase your price. 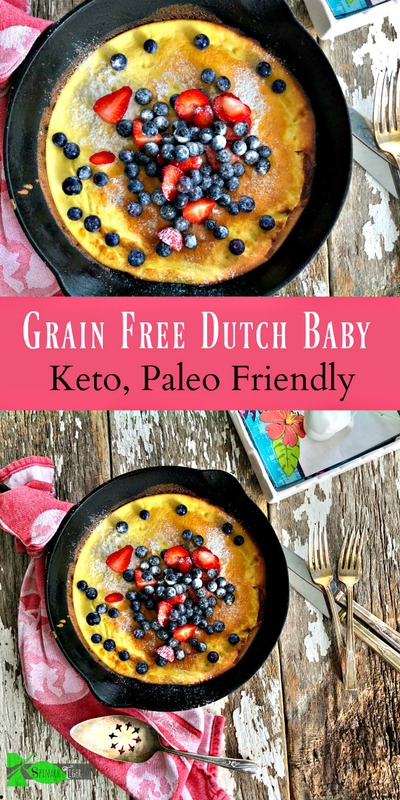 Grain Free Dutch baby is a low carb, keto friendly baked pancake. Preheat oven to 425 degres F.
Mix al dry ingredients together, making sure baking powder is thoroughly mixed. Melt butter in cast iron skillet in oven until butter is bubbly. Pour mixture into pan and shut oven. Bake 13 to 17 minutes until the center is springy. Serve immediately with fresh fruit and cream. If you have medium to large eggs, use 4 eggs. This recipe contains Amazon affiliate links, which earn a commission toward operating costs, but do not increase your price. 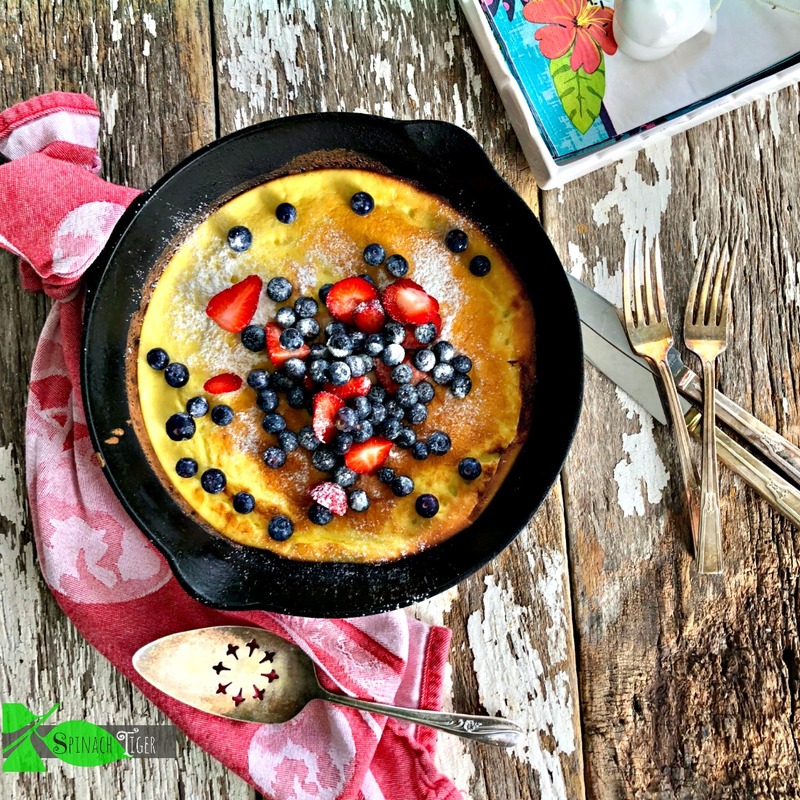 We FINALLY tried your dutch baby and it was awesome! Used a cast iron skillet marked 8 for 15 minutes. It came out fluffy and moist and the orange flavor was inspired. Best of all the cook gets to eat with everyone else! This is our new pancake, thanks! I made it this morning using a glass pie plate. We really enjoyed it with fresh blueberries, raspberries and, of course, bacon. Thank you! Thanks for letting me know. I like the bacon idea. By far the best tasting pancakeever. I’ve made so many that tasted eggy or just gross. I believe the orange extract is a must. Adds a wonderful flavor. I had large eggs and was reluctant to add the addition egg, but I did and it was just yummy. Hard to stop at one serving. Thank you for sharing. Finally a pancake my family can enjoy. Thank you so much for letting me know. Yesterday we made these with some apples. So good. This looks great! But I have a question on the serving size. The recipe states 2 servings, but the nutrition information says a serving is 1/4. Is the serving 1/4 of the recipe or half? Thanks! What are the macros on this, please? That’s a good question. I think I’ll try one without the baking powder and see what happens. OMG!!!!! This was amazing!!!! Just started Keto a few days ago and I’m still amazed at how yummy this food can be. It was huge and I ended up cutting it into quarters. I didn’t have any extract so I added a little cinnamon since I was going to make these like cinnamon rolls anyway. Had cinnamon and butter sauce with a little cream cheese icing…all Keto friendly!!! Had a great texture…I’ll pickup extracts next time I’m at the store so I can make it exactly like yours. I like YOUR ideas…the cinnamon. I’ll be trying that one. I also recently made a simple syrup with swerve and maple extract. This is so versatile. Thanks and I’m glad you liked it. I just did a keto tortilla you might love too. When you say butter sauce, is it just clarified or are there other ingredients. Always looking for new ideas, thank you. I made this for breakfast. The recipe doesn’t say what size skillet to use. I baked it in a 9″. It was more like a cake —- still very good. Should I use a larger pan the next time. Thanks. That’s a great question. I go back and forth myself. The last time I made it in a cast iron that is nine on bottom, 10 on top. It really doesn’t matter. Thanks for writing.